This review originally ran in the Friday, September 14, 2012 issue of Shelf Awareness for Readers. If you don't already subscribe, sign up here to receive a bi-weekly dose of readerly goodness in your inbox. At first blush, Erika Robuck's Hemingway's Girl is a historical romance, with the young Mariella Bennet capturing the attention of the famous writer, Ernest Hemingway, and of Gavin Murray, a World War I veteran working to build new roads. But as Robuck plumbs the depths of Depression-era Key West, it becomes apparent that her novel encompasses much more than that, telling the story of a girl caught not only between two lovers, but two worlds: the lofty world of the rich and powerful versus the much more real world of fishermen and family. Robuck has drawn on historical documents to craft an impeccable story of Hemingway's life in the 1930s--from a photograph of the author that includes a haunting young girl dressed in fisherman's clothes, to an account he once wrote about the unnecessary deaths of dozens of veterans and civilians during the destructive Labor Day Hurricane of 1935. 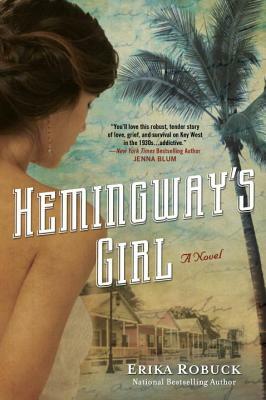 This attention to historical detail is what makes Hemingway's Girl succeed; there is enough truth woven into Robuck's well-imagined story to inspire readers to learn more about the time period, the place and the author himself, and enough detail about the Keys to leave readers longing for a vacation to see the islands in person. Ultimately, Hemingway's Girl proves to be a stunning portrayal of a revered and oft-studied writer and a probing novel of family ties, love, betrayal and a love of the sea--all themes present, perhaps not surprisingly, in Hemingway's works as well.